I have a great niece who wants to learn to bead crochet. 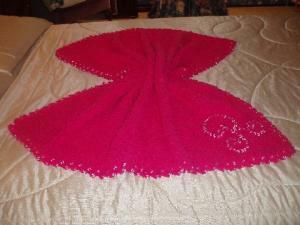 She can crochet and has has done loom bracelets and some other beaded crafts. I know there are lots of stuff available on the Internet, but she doesn't have lots of access, so I'm looking for books and lists of materials I need to get to help get her started. Her Mom will work with her to get her started if they have the resources. Her Mom knits, but has learned enough crochet through the crochet materials she has to teach both of them the basics. She's also helped her learn the basics of the loom bracelets and the other crafts so I think books would work with a back of the Internet when they can get to it. Our library has a few books on the subject and I have them on hold to review. However, none of them look terribly kid friendly. If anyone has any suggestions on some books that demonstrate the techniques in easy to see pictures along with some easy projects I'd appreciate the suggestions. I know of 2 ways to apply beads. One is easy and the other is more difficult and time consuming. I just looked in my favorite reference book, "A to Z of Crochet" and it only shows the more difficult way. 1. Where you want the bead, remove your hook from the loop. 2. Insert the smallest hook (I use a miniature latch hook that I found in the notions section at AC Moore) into the bead. 3. Catch the loop and pull it through the bead. 4. Put your original hook back on the loop and continue crocheting. Note: this puts a double strand of yarn in each bead. Also, if the bead is going on a chain, it counts as a stitch. 1. Put a needle on a long piece of thread and tie the ends to the yarn. 2. Using the needle, thread all of the beads onto the yarn. 3. Start to crochet, moving the beads down the yarn. 5. Crocheting the bead into your work depends on what kind of stitch you are using. Here is where you'll need a reference book/internet video. While ago I did crochet couple items with beads for my granddaughters. That was the "hard way". I did a Monogram blanket & couple hats. I remember..that was not fun at all to keep on mooving all those beads. I did not wanted to have knots there. So I did put on that yarn all those beads to be anough for that edging around & some extra just in case I miss counted. That is not hard at all to do that, it is just very time consuming. Your niece should not have any problems. 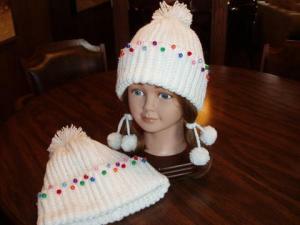 2) Jelly Beans Hats, that is what I call them. They did look like a colorful jelly beans:). I think her main interest is jewelry. I found a couple of books at the library. Just need some time to sit down and review them to see if they'd work for her. Most jewelry are done with size 10 thread and small seed beads. There are kits on the Mary Maxim site. She needs to find beginner projects first. I suggest headbands using pony beads and thicker yarn. Stringing versus hooking beads give a different look as they are attached differently. She's done other beading projects including the beaded loom stuff. I think she wants to move on to crocheting as a different style/skill.